Historical research indicates that, more often than not, when Congress is in session there is a negative effect on equities markets (the "Congressional Effect") due possibly to investor uncertainty surrounding government action or inaction as well as the unintended consequences of Congressional legislative initiatives on the stock market. Author Eric Singer, a financial professional with over twenty-five years of experience, is an expert on this phenomenon, and with this new book he shares his extensive insights with you. 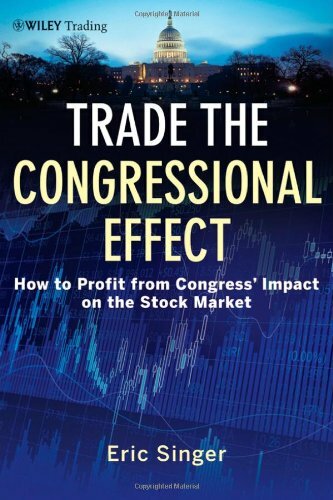 Trade the Congressional Effect skillfully details how you can profit from Congress's impact on the stock market. Along the way, it puts this approach in perspective and gives you all the tools you'll need to profitably incorporate it into your investing endeavors. Singer walks you through the process of trading the Congressional Effect and provides practical guidance regarding the possible pitfalls and opportunities you'll face each step of the way. Supported by over forty-five years of real world data, the Congressional Effect has proven profitable to those who know how to use it. This timely guide will show you exactly what it takes to make this phenomenon work for you.